I'm not a fashion guru at all, but more importantly I am a child of God. More importantly, I am a child of the Light and have been called to walk in that Light (Ephesians 5:8) so that others would be able to find God through the light my life shines (Matthew 5:14, 16). 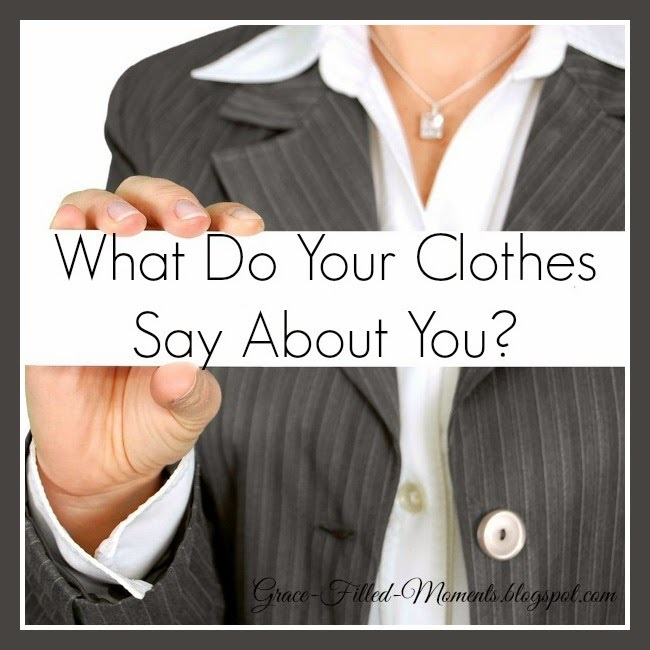 The choices I make with the clothes I wear should bear witness to my identity and calling. There should be a definite contrast between the clothes I wear versus the clothes worn by those living in and for the world. Today in Exodus 28 we see the instructions God gave Moses concerning the garments of Aaron, the High Priest, and his sons who would minister as priests alongside him. Let me encourage you to do a study of what each piece of those garments mean and you will find Jesus and His ministry pictured throughout! It is very exciting! Here is something I found in the David Guzik Commentary on the Bible during my study time comparing the clothing worn by Jesus when He completed his wonderful priestly work on our behalf and the garments worn by the High Priest. 1. Jesus wore no beautiful ephod - only a purple robe for mocking. 2. Jesus had no precious gems on His shoulders - only a cross that we deserved. 3. Jesus had no breastplate with "Israel on His heart", yet He died of a broken heart for Israel - and all of mankind. 5. Jesus had no delicate sound of bells proving that the High Priest was alive, only the sound of pounding nails ensuring our High Priest's death. WOW! Praise the name of Jesus - our High Priest!! Think about THIS when you decide what you are going to wear today! I know I will!! Observations: God gave these instructions to Moses for the care of the lampstand. With the pure oil of pressed olives there would be no smoke as the oil burned. The lampstand was the only source of light in the Holy Place and had to burn continually. Aaron and his sons were to tend the lampstand from evening until morning to ensure the light would not go out. With its light shining on the table of showbread and the altar of incense, Aaron and his sons (priests) would be able to fellowship with God and intercede on behalf of the Israelites. Kneel: Heavenly Father, I am amazed at the detail You used in the tabernacle that points to the true Light of the world, Jesus Christ. I pray that we would walk as children of light so that others who are walking in spiritual darkness would come to know Jesus Christ as their Savior. Help us to daily spend time in the presence of the Lord and to remain in Him so that we can do all that we have been called to do as Your children of light. In the life saving name of Jesus I pray. Amen! 36 “You shall also make a plate of pure gold and engrave on it, like the engraving of a signet: HOLINESS TO THE LORD. 37 And you shall put it on a blue cord, that it may be on the turban; it shall be on the front of the turban. 38 So it shall be on Aaron’s forehead, that Aaron may bear the iniquity of the holy things which the children of Israel hallow in all their holy gifts; and it shall always be on his forehead, that they may be accepted before the Lord. Observations: The turban worn by Aaron the High Priest has a pure gold plate with the inscription, “HOLINESS TO THE LORD” engraved on it. It was to be worn when he brought the holy gifts of the children of Israel to the Lord so that He would accept them. Application: Holiness is the power of a life separated to God. We have access to this power through the Holy Spirit that we are given at the time of our salvation. The same power that raised Christ from the dead is now alive and active in our lives (Romans 8:11)! Hebrews 4:12 tells us to “pursue peace with all people, and holiness, without which no one will see the Lord.” We must strive for holiness – purity in our lives – that has been provided once and for all through the sacrifice of Jesus Christ that makes us accepted by God (Hebrews 10:10). Kneel: Heavenly Father, thank You so much for the grace given to us by the power of Your Holy Spirit that enables us to be who You created us to be and to do all that You have called us to do. May we seek to live our lives through the power of Your grace at work within us so that others would see our good works and glorify Your name and come into a saving relationship with Jesus Christ! Help us to pursue a holy life by continually being in Your Word in order to know what a life that is surrendered to you looks like. Help us to pursue a holy life through prayer whereby we call on the power of the Holy Spirit living within us that is able to quicken our bodies to live in submission to Your will. I magnify and glorify Your holy name, Father! I pray and ask this all in the life-changing name of Jesus. Amen! I'll see you back here on Friday for another Blogging Through the Bible post! I hope your time in this week's reading of Exodus has been just as exciting for you as mine has been for me! What is God showing you this week? Please share in the comments below and let's grow together from our time in the Word! 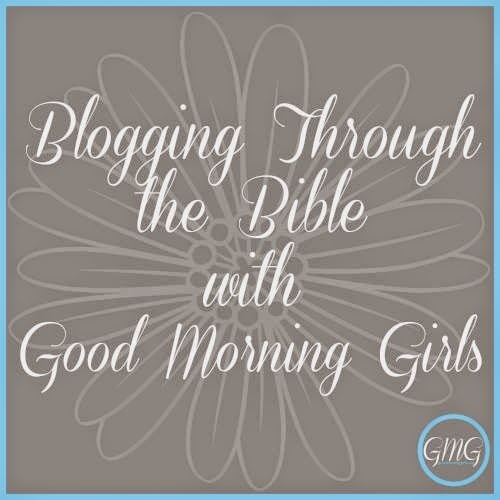 I'm linking up with Courtney Joseph over at Women Living Well, home of Good Morning Girls for Blogging Through the Bible. Please click on the image below to read more posts from others who are also BTTB!